The tripeptide glutathione is one of the most important elements to enhance the health of the organism and to protect the cells. In this sense, glutathione has three main functions or properties, which are its detoxifying effects especially at the level of the liver, immune enhancers, and antioxidant elements. Our own body has the ability to synthesize its own glutathione through the amino acids cysteine, glutamine, and glycine. However, there are certain circumstances in which the available cysteine and glutamine are scarce. All these stressors can reduce the amount of glutathione that our body produces endogenously, which means that we are more predisposed to suffer cell damage, aging and, in the long term, several diseases. To balance this deficiency it is recommended to consume glutathione supplements. We can also enhance the glutathione synthesis endogenously by consuming N-acetylcysteine or N-acetyl-L-cysteine supplements which are the main precursor of glutathione. Until recently, scientists thought that glutathione could not be assimilated properly by the organism, and that, in order to increase its levels in the organism, the best thing to do was to consume precursors such as N-acetyl cysteine (NAC) and other substances such as alpha-lipoic acid. Recent studies have shown that glutathione itself can be absorbed correctly in significant intakes, which means that supplements of this substance are a good alternative in order to stimulate its levels in the cells. The main source of glutathione is acetyl glutathione, which, since it is stable, is not eliminated in the digestive tract, rather it is distributed to all the body cells. Glutathione is found in a wide range of fresh fruits and vegetables, fish and meat (especially turkey and chicken). Walnuts, spinach, potatoes, asparagus, avocado, cola, pumpkin, granola, melon, cauliflower, broccoli, garlic and tomatoes are rich in this substance. As well as grapefruit, peaches and oranges. Glutathione is associated to anti-cancer properties, it is a great liver protector, and it even favors a better functioning of the immune system by increasing the amount of lymphocytes and natural killers (NK cells). Glutathione plays a very important role in the protection of the body from oxidative stress. It has the ability to capture reactive particles before they can damage cell structures like DNA, RNA, proteins, or membranes. The reduced form of glutathione neutralizes the majority of the free radicals and reactive oxygen particles, such as the hydroxyl radical, superoxide, and fatty acid radicals. Glutathione also has the ability to "recycle other antioxidants". It can re-activate the oxidized forms of vitamin C, E, alpha-lipoic acid, and coenzyme Q10. Thanks to glutathione, these anti-oxidants can be used once again. Glutathione enables the detoxification of xenobiotic substances. Glutathione has the ability to bind to fat-soluble toxins, such as heavy metals, solvents, and some pesticides, these become hydro-soluble so that they can be eliminated through the urine. This is because the glutathione molecule has sulphur compounds. This sulphur forms a sticky substance that allows the toxins to adhere to it, which are then transported through the organism until they are excreted and eliminated. There is evidence that glutathione is the substance that produces the daily detoxification of the liver. The liver is the largest deposit of glutathione. Several studies have proven that low levels of glutathione may have a negative effect on the liver function. Certain diseases (hepatitis, cirrhosis, or liver damage due to alcohol consumption), and especially aging, trigger an overload of the liver which can be damaged. This will inhibit the optimal detoxification of the organism. A glutathione supplement will facilitate the elimination of these toxins, resulting in the enhancement of the health of the liver. Glutathione strengthens the immune system and reinforces our defenses against all kinds of pathologies. The immune system is constantly "hunting" pathogens and foreign antigens (viruses, bacteria, fungi, parasites, pre-cancer cells, etc.) that can cause cell damage, toxicity, and various diseases. To eliminate these pathogens, the body needs to have an adequate level of glutathione, since it acts as the "fuel" for the defensive cells of the immune system. Glutathione encourages the correct functioning and multiplication of our lymphocytes (white blood cells). After coming into contact with the antigen, lymphocytes must multiply very quickly and, above all, create antibodies and interleukins, and they need glutathione in order to do this. It has been clinically proven that glutathione is very important to protect the body from infections, serious autoimmune diseases, and even cancer. A healthy and strong immune system is essential to prevent autoimmune diseases such as thyroiditis, lupus, psoriasis, and many others. Studies on the relationship between glutathione and the immune system have shown that glutathione may even help in the treatment of serious conditions such as HIV. A glutathione deficiency is not limited to a certain age or lifestyle, anyone can suffer from it, even when following a healthy and balanced diet. Low levels of glutathione can cause many health problems, such as ADHD, multiple sclerosis, joint pain, fibromyalgia, and diabetes. Glutathione supplements are the most efficient way to increase the levels of this valuable molecule in our body and protect it from the risk of suffering from all kinds of serious disorders and pathologies. People who are often sick need to take into account that they may suffer from a glutathione deficiency, which is why the consumption of glutathione supplements is the most recommended solution. Glutathione supplements are very beneficial for athletes. When they carry out efforts, they are subjected to a large amount of free radicals, and glutathione can help to prevent the tissue damage from happening. People looking for antioxidant protection to take care of their health overall. People who want to help their body with the elimination of toxins. People who want to take care of their hepatic health. 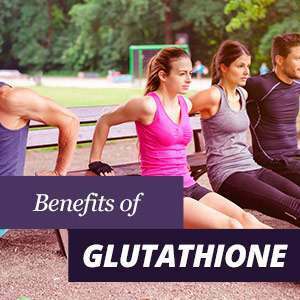 It is very rare for glutathione to cause side effects. Mild abdominal pain and nausea have occasionally been observed. On the other hand, it is believed that a prolonged intake can produce a reduction of the levels of zinc. For this reason, it is advisable to also use zinc supplements as long as you are consuming glutathione. It is not known whether the use of glutathione is safe during pregnancy, so to avoid any risks, it is preferable not to consume it. Glutathione is considered a completely safe supplement. There are no known interactions of glutathione with other substances. But it is recommended to consult a doctor if other medications or substances are being consumed. Alcohol reduces glutathione levels, which is why drinking alcohol should be avoided while using glutathione, since it may cancel its effects. Many people also use N-acetyl-L-cysteine (NAC), a form of cysteine, along with glutathione. It has also been shown that milk thistle increases glutathione levels, so the simultaneous consumption of these three substances ensures proper levels of glutathione. Usually the daily recommended intake of glutathione is 100 to 500 mg. However, you must follow the instructions of each product, in order to get the most adequate amount. Glutathione is also known by other names, such as GSH, glutathione, gamma-L-glutamyl-L-cysteinylglycine, gamma-Glutamyl cysteinyl glycine, L-glutathione, reduced glutathione, N-(N-L-gamma-glutamyl-L-cysteinyl) glycine.